A rather small, smooth herb, with creeping stems and perennial root-stock freely rooting at the nodes, the ends erect, 6 inches to 3 feet long. Leaves opposite and petioled, oblong, ovate or oblong-lanceolate, toothed, 1 to 3 inches long, one-fourth to 1 inch wide. 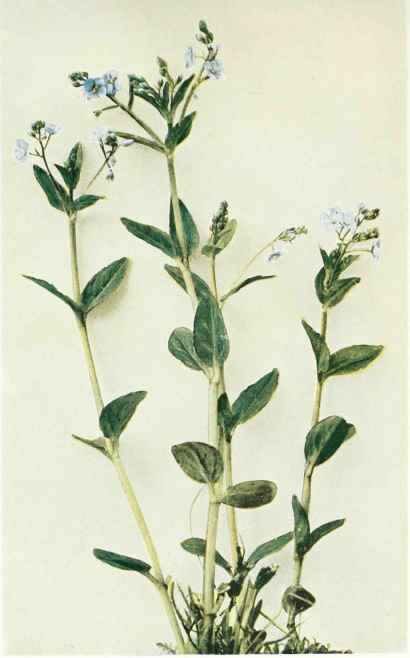 Flowers blue or whitish, striped with purple or blue lines, about one-fifth of an inch broad in loose, axillary, elongated racemes, each flower subtended by a small, green bract. Calyx four-lobed ; corolla rotate and also tour-lobcd, the lower lobe commonly the narrowest. Stamens two, wide-spreading, attached to the base of the upper lobe of the corolla on either side. Fruit a globose capsule, about one-eighth of an inch high, slightly compressed. Frequent in brooks, ditches and swamps, Anticosti to Alaska, south to Pennsylvania, Nebraska, New Mexico and California. Flowering from spring until late summer. There are a number of other Veronicas or Speedwells, many of them small, introduced weeds with inconspicuous flowers. The Marsh or Skullcap Speedwell (Veronica scutellata Linnaeus) has light-blue flowers about the size of those of V . americana, and linear or linear-lanceolate, sessile leaves. The Common Speedwell or Gipsyweed (Veronica officinalis Linnaeus) is hairy all over with oblong, oval or obovate leaves and blue flowers in spikelike racemes from the axils of the upper leaves.